Your customer experience is being compared to everyone, not just companies in your industry. All employees can benefit from dealing with customers. Be clear about what you can and can’t do and manage expectations. An invisible service provider is someone the customer never sees or interacts with who nonetheless has an outsized impact on the customer experience. An example of this is the housekeeping if you’re staying at a hotel. When they fail at doing their job, the customer notices, even if they’ve never interacted with that person, and another employee has to deal with hit. The key is to get these employees in front of customers, even if they don’t regularly interface with customers. Identify the invisible service providers in your business and offer customer service training since their roles include providing this. Find ways to make invisible service providers more visible, even if it’s not live and in person. Everyone has experienced this at one time or another: the joy and horror of contacting customer service. We go over our highlights (and lowlights) of reaching out for help and we also get some calls from our listeners to hear what they think. Be upfront with customers about what you can and can’t do and you’ll manage expectations appropriately. Empower your customer service to be able to go above and beyond, and you’ll reap significant benefits. In response to our segment about the Healthcare Industry in episode 9, we received a tweet pointing us to Network Health Wisconsin. They explain health insurance using everyday language, and it’s really refreshing to see a company approach their industry this way. Look out for the jargon in your industry and make sure you find a way to translate those for your customers. Remember that customers don’t always speak the same language that you do, so sometimes the simplest words carry the most weight. 78% of customers will drop your business after one bad customer service experience. 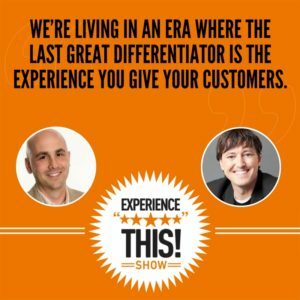 Dan and Joey talk about why the customer experience bar is getting higher, and how you can make a difference. Focusing on providing a great customer service is vital in a more connected world. You’re not just competing against other people in your industry; it’s also Apple, Amazon, Netflix, Tesla, and all the companies out there who are committed to creating remarkable customer experiences. Dan: Get ready for another episode of the Experience This! show. Joey: Join us as we discuss the invisible people who make or break the customer experience, why we love and can't stand calling customer service, and health insurance that actually speaks our language. Dan: Invisibility, availability, and readability, oh my. Joey: There's so many great customer experience articles to read, but who has the time? We summarize them and offer clear takeaways you can implement starting tomorrow. Enjoy this segment of CX Press, where we read the articles so you don't need to. Dan: Today's CX Press article comes from a customer service expert named Jeff Toister. The article found on his website at toistersolutions.com is called the out-sized impact of invisible service providers. Joey: Hey, Dan, real quick, before we get into this too much, when you say invisible service providers, I'm not entirely sure that everyone's gonna know what that means. Can you describe to us what an invisible service provider is? Dan: Well, thank you for asking that, Joey. I appreciate it. An invisible service provider is actually somebody who the customer never sees, or even interacts with, but who has a giant, out-sized impact on that customer's overall experience. Joey: Makes perfect sense. For example, when someone stays at a hotel, an invisible service provider example might be the housekeeper that's taking care of the room that their staying at in the hotel. Dan: Exactly, and that is one example that Jeff uses in his article. He particularly pointed out one housekeeper that left a personal note to him, which included her name and included a mint on his pillow. But he also gave some other examples that were ones I hadn't really thought of, like a baggage handler on an airplane or a dishwasher at a restaurant. Or think about all of the people who touch every single package you order from Amazon before it arrives at your door. Joey: Yeah, that's interesting, because I have to admit, as you know, I stay in a lot of hotels. I always do my best to tip the housekeeper at the hotels I'm staying. But I never really thought about the dishwashers at the restaurants I eat at, or all the people that must touch an order that I placed from Amazon, because we get a lot of deliveries from Amazon, as, I know, you do, as well. Dan: Well, Jeff explains that these invisible service providers have a huge impact on the overall experience, because when they fail at doing their job, the customer notices, even if they've never interacted with that person. Imagine losing your baggage after a flight or getting a dirty plate at a restaurant, when these things go wrong, it's usually some other employee that has to handle the problem with the customer, which then, of course, adds cost to the company and, of course, aggravation to the customer. Joey: This makes so much sense. I think, lots of times, companies have a tendency to forget the large variety and range of people who contribute to the overall customer experience. I love the suggestions that Jeff makes in the article about making your invisible employees more visible. One of those examples he talks about restaurants putting a video monitor into the kitchen so that the cooks could see the customer. What was fantastic about this is that the customer satisfaction, actually, increased dramatically in these restaurants, even though they didn't necessarily know that this was going on. How cool is that? Also, software companies having developers spend time answering support tickets, so they're not the ones who actually work in support, but they're getting that exposure to the customers and seeing them. Airlines having baggage handlers attend customer service training alongside the gate agents, even though the baggage handler will rarely ever come into contact with a customer directly, having them go through that training is a great way to get that exposure. Dan: In almost every job I've had, Joey, I've had the experience of sitting with customer service agents in a call center and listening to calls. 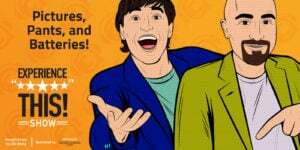 There is nothing better to understand, both, what your customers are actually saying, and also the life of this invisible service provider, and how they do their jobs, and how they interact with customers. I definitely recommend to people that they do that. Have you done that as well, Joey? Joey: I have. It's funny, when you mention that it brought back a memory. It's such a simple thing. I actually, years ago, and it's important for me to emphasize many years ago, I worked in the White House. One of the cool things is my boss required ... I worked as a lawyer. Our boss required us to go down and work the phones at the ... There's a phone number you can dial to leave a message for the president. We were required to go down and work those phones at least once a quarter for at least an hour. He was adamant that we needed to keep in regular consciousness of the fact that we were there to serve the American people. He wanted us to remember that by talking to actual citizens who are calling in asking questions about their government, and registering their opinions about how the government was being run, or what they were doing or not doing. It was such a little thing, but it really ... Every time I did it, it helped me to kind of recommit to the job. I think it's something that's so easy for employers to do is to get every employee that you have in front of customers on a regular basis to allow for a special type of connection, not only for the employee, but then the customers actually realize that there are a lot of people contributing to them receiving the product or the service that they want and how all of these folks kind of work together to make that happen. Dan: Totally agree, and every time I've spent time in a call center, I always come back to my desk with 100 things that I want to do, because I'm very inspired by what I've heard. Let's jump to the key takeaways of Jeff's article. Of course, as always, we'll leave a link in the show notes at www.experiencethisshow.com. The key takeaways are be sure to identify the invisible service providers in your business. Then offer them customer service or customer experience training since their roles include providing these things. If they don't know how to provide good service or a good experience, then how can you expect them to do so in their role? Then, as Joey mentioned, find ways to make these really important people more visible, even if it's not live and in person, I think the example of the handwritten note on the hotel room pillow is a great one to emulate. Are there any parts of your customer experience where you could have some invisible service provider leave a note to one of your customers, for example? Joey: Sometimes, the customer experience is amazing. Sometimes, we just want to cry. Get ready for the rollercoaster ride in this edition of I Love It/I Can't Stand It. Dan: Welcome to another edition of I Love It/I Can't Stand It, one of my favorite segments, Joey. Today, we're gonna be talking about something that I know every one of our listeners has experienced at one time or another. That is contacting customer service. Joey: Ah, the joy and horror. Dan: Now, I know it doesn't matter how you contacted customer service. It could be via telephone, email, chat, social media, message apps, smoke signals. However you do it, these are some things that we love and can't stand about doing so. I'm very excited, that as soon as we're done sharing our loves and can't stands, we're gonna be hearing from you. Joey, why don't you get us started with something that you love. Joey: You know, Dan, this is so straight forward and simple. I love it when I call a company, and a human being actually picks up the phone. I understand the benefit of having things go to a phone tree or having a prerecorded message. But there's just something a little nostalgic, old fashioned, and makes you feel human when you actually get to talk to a human immediately. Dan: Totally, totally agree with that one. I also love it when companies offer me the option to have them call me back when a representative is available. This just happened to me recently. I think it's a genius solution that fixes one of the biggest pain points of calling in, which is a long hold time. I would so much rather them say, "Hey, we're gonna call you back in 45 minutes," rather than me sit and listen to bad hold music for 45 minutes. Joey: So true, everybody wins. It makes you feel like you have a little bit of control. I love it. I also love it when companies give me the opportunity to email or to fill out a simple web form on their website. As much as I have a tendency to default to liking to talk to people, there's sometimes when there's not enough time, and I just wanna fire something off or it's at a weird hour. I have a tendency to be a night owl. Sometimes I'd love to be able to just ping someone with a customer service request, and go to sleep, and have the message in my inbox when I wake up. Love the idea of being able to go about what I want to do with my life and have them get back to me later. Dan: Related to that, I know this is gonna come as absolutely no surprise to you, but I love it when brands respond quickly on social media. Joey: What, you're talking about social media, Dan? Dan: I know, what a shocker. Joey: I'm in shock. Let me get up off the floor. Okay, I'm back. Dan: All right. But I think it is such a good feeling as a customer to know that a brand is paying attention and willing to help solve my problem quickly and publicly. I've said it before. I'll say it again. To me, this is the best way for companies to demonstrate publicly that they care about their customers. I know it's a hard job, but folks, it's also a job you signed up for. If you work in one of those roles, try to approach each caller, each customer interaction fresh. Show that you care right out of the blocks, because, in my experience, nothing will diffuse an irritated customer faster than quickly feeling that the person they're speaking to hears them and is going to do their best to help them. Even if you don't actually accomplish the goal of being able to help them solve their problem, sometimes people just wanna feel heard. Dan: Absolutely. I also love it when companies are upfront about their hours of operation or their agent availability. It's okay if you're not available 24/7. It's just not okay to not tell people about that. Rather than having a click-to-chat button on your website that's grayed out or sometimes they disappear completely when an agent isn't available so people are, "Oh, I saw this button the last time I was here. I wonder where it went." Why not just display the hours of operation on the website so the people don't expect a live agent when one isn't available? To me, that is such an easy thing. If you set expectations with your customers, then you're able to meet them better. But if you don't share the expectations, then you are subject to their expectations, which might be based on an international airline they just contacted, which is available 24/7. If you're not available, let them know. Most people are gonna understand. But don't let them think that you're available. I had an experience once with a chatbot on Facebook Messenger where I got into some trouble, and I said, "Help." It said, "Do you wanna talk to customer service?" I said, "Yes." Then it said, "Customer service is closed." It's like, "Come on, don't offer me that if it's closed." Dan: Okay, so those are the things we love. Joey, why don't you start us off on things you just can't stand about contacting customer service. Joey: What's interesting about this, Dan, is, as far as the ones that I can't stand, there's some pretty obvious ones here. I think the most obvious one is you need to be where your customers are and meet them where they are. Don't try to force your customers into a channel they don't want to use. I defer more to phone calls. I like to have a phone conversation with someone. I like to be able to connect via phone. My wife, for example, is not as quick to use phone. She would rather chat or email. Try your best to meet your customers where they're at. I think you absolutely need to have a phone solution. And you absolutely need to have an email solution. Chat, social, other ways of connecting, yes, build those in after the fact as your company grows and you have more access to resources and revenues. In the beginning, you gotta have phone, and you gotta have email. Dan: Yeah, I agree. I mean, a lot of people ask me which channels should we be in within the social media. My answer, which some people don't like, is wherever your customers are, and they'll tell you. Dan: Another thing that I can't stand, and we've talked about this on this show, is horrible hold music. Drives me nuts. Now, if you did not hear episode six when we talked about and heard Alex Cornell's awesome I'm on Hold song, go back and check it out. But please, people, the 1970's Kenny G Muzak has got to go. Joey: Let's be candid. There's nothing wrong with some soothing, Kenny G, just not when I'm on hold and trying to talk to a company about a problem I have with their product or service. Save that for the easy listening late at night when you have nothing else to do. Another thing that drives me crazy is when the customer service agent is neither empowered enough nor educated enough to solve my problem. Here's what I mean by that. Lots of times you talk to a customer service rep, and they have no idea how you might have had the problem that you had with their product or their service. I think every company needs to make sure that all of its employees have actually used the product or service. You see this in restaurants al the time. I think I've mentioned this on the show before. It drives me crazy going to a restaurant you've never been. Because I travel a lot, I find myself in restaurants I've never been in and will probably never go in again. I'll ask the waitstaff, "What do you recommend here?" They're like, "I don't know." It quickly becomes apparent that they've never actually eaten the food in the restaurant that they work in. Same goes with a product company. If your employees haven't actually used the product, how do you expect them to be able to troubleshoot when a customer has a problem? Additionally, your customer service reps need to be empowered. All too often we hear, "Well, there's nothing I can do about that." Give your customer service, your call center rep people, incredible, incredible capability to solve problems. Let me tell you, yes, I know that will cost your business, but the reward and the return on that investment will absolutely blow your mind. Dan: Totally agree. As I was listening to you, in my head, I was still stuck on being on hold, which is kind of ironic. But what I can't stand when I'm on hold is when that ridiculous message repeats over and over again that my call is really important to them. You know what? If it was that important, I wouldn't be sitting on hold, right? Dan: No, don't do it. Joey: ... that I promised I wouldn't do. But we're so close. I mean, it's like, "Come on, people. You're lying to us when you say the call is important to us, but you're not treating us like we're important. Just stop doing that." Along that same vain, something I can't stand is when the message says, "We're experiencing unusual call volume." I've called at 2 o'clock in the morning, Pacific. No one should be awake at this time. No one in North America is awake. I'm calling a US-based company, and they're saying they're getting unusual call volume. No, you have that message on every time I call you. Go out and hire some more reps. Just do it. Or even better, if you can't do that, just eliminate the unusual call volume thing, because everyone who's listening and waiting on hold knows that that's total BS. Stop doing it. Dan: Totally agree, sometimes saying nothing at all is a whole lot better. Dan: The last thing I can't stand is when companies hide their contact information. There are some very high-profile companies that have done this for a very long time. To me, it's really obvious what they're doing. Frankly, it tells me that they don't wanna hear from me. As a customer, that's kind of offensive to me, because when I have an issue that I need resolved, I want them to help me. I've said this before as well, but when customers have complaints and they share complaints with you, that, generally, is a good thing, because the ones that don't share their complaints are already off using your competitor instead. Do not hide ways to contact you, because you're trying to save money. It's like anything else, that if you ... Denial is not an answer. If you try to just close the door and hope that the monster on the other side isn't really there, it's still there. When companies decide that they don't wanna hear from their customers, I just think that's really bad business. Joey: I totally agree. What I will say about this, and you kind of triggered me into something I wasn't gonna talk about, but I have to now. Three times in the last 24 hours I've tried to reach out to someone that I'm in fairly regular contact via email, but I needed to call them. I could not find their phone number. The reason I could not find their phone number is because they don't have it in the signature line of their email. People, if you do nothing else, if you take no other action step listening to this podcast other than this one, go change the signature line of your email and put in your phone number. People will thank you for it. You don't have to worry. It's not like a ton of people are gonna call you. But, man, the number one thing I do when I need to get in touch with someone is I quick scan to see if I have their phone number, because then I can call them. We can get things sorted out. But anyway, those are things that we thought were awesome about dealing with customer service and, frankly, not so awesome about dealing with customer service. But now, we are super excited to hear from some of our listeners and what they love and can't stand about calling customer service. As you know, we are trying to make this show as engaging as possible. We want you to email us and call in. To be candid, in the last two or three weeks, it's been fantastic. We've been getting a lot of emails, a lot of messages on the SpeakPipe. Keep it up, folks. We wanna be able to include you. Here's some recordings of audience members that called in to let us know what they love and can't stand about calling customer service. Dana: Hi, my name is Dana. One thing I love about contacting customer service is when the person is friendly and actually cares about your issue. One thing I can't stand about contacting customer service is being transferred more than four times. Kathical: Hi, my name is [Kathical 00:19:39]. The one thing I love about contacting customer service is that you are talking, and a real human person is listening to you. The one thing I can't stand about contacting customer service is the very long hold time. Harry: Hi, my name is Harry. One thing I love about contacting customer service by social media is in-the-moment channel resolution. One thing I can't stand about contacting customer service by social media is being directed to traditional, contact-centered channels. John: My name is John. One thing I love about customer service is when my question or issue is resolved quickly. One thing I can't stand about customer service is when I need to repeat myself via transfer or on a different channel. Dan: Thanks so much to our listeners for bringing us those awesome recordings about what they love and can't stand about calling customer service. If you, too, would like to have your voice heard on this show, go to www.experiencethisshow.com, click on any episode. Scroll down to the bottom, and you will see a little widget called SpeakPipe. It's basically like digital voicemail. Click on it, and you can leave us a message. If you wish, leave us with something that you love and can't stand about some topic. If it's a topic we haven't covered, we will be sure to cover it in a future episode. Joey: We love telling stories and sharing key insights you can implement or avoid based on our experiences. Can you believe that this just happened? Dan: I wanted to follow up on a Say What?! segment that we did in episode nine about the healthcare industry and the so-called explanation of benefits. You may remember that I told the story of a survey of several thousand Americans who were asked to define four healthcare terms. Basically, three quarters of America said they could do it. Then when they were asked what the actual definitions were, only four percent said that they actually knew the definitions. Well, after that episode aired, I received a tweet from AE Marketing group. They are @aemarketing on Twitter. The tweet said, "Not every healthcare brand uses jargon. In 2012, Network Health Wisconsin committed to speak your language. Today, they lead Wisconsin and national satisfaction quality data with both employees and customers." Fascinated by this response, I jumped over to the Network Health Wisconsin Twitter handle, which is @NetworkHealthWi and I immediately fell in love. First of all, their profile description says this, and I quote, "Health insurance causes people stress. That's beyond ironic. Network Health is determined to fix that. So we're here to help, listen, and grow together." I clicked onto their website. We, of course, will include a link in the show notes at experiencethisshow.com. I found a terrific dictionary that is called Understanding Health Insurance. Get this, the website actually says, "We know health insurance is complex. Let us translate the jargon so you don't have to." Sound familiar? Joey: I absolutely love this. I love that ... Well, there's so many things I love about this. Number one, I love that one of our listeners reached out to make us aware of that. Folks, everyone who's listening, you're as much a part of this podcast as Dan and I are. We love the engagement. We love when you reach out and become part of the experience. Number two, way to tweet it, Dan, instead of me, because he's the tweeter in our family, not me. Number three, I love the fact that health insurance is messy, and these folks at Network Health Wisconsin are doing their best to clean it up. I mean, I spent three years in law school. I spent five years practicing law. Legalese is something that ... I don't say this from a place of ego, but I've been trained in this. I'm familiar with this. I still struggle when I see an explanation of benefits or I see the terminology that health insurance companies are using. It drives me insane. So I love that they've decided, "We're going to help our customers understand what these terms mean." The fact that it's on the front of their website, so it's not like you have to be a customer to access this. You can be a customer of another health insurance company and go to their website to understand what your health insurance company is saying. It's a super easy interface, which I love, where you click and they explain what the word is, and they define it. This was just absolutely fantastic. I was so thrilled to learn about this site. Dan: Yeah, I totally agree. Yeah, just a couple of examples. One of my favorites is the word formulary. You know what a formulary is? Dan: It's just a list of drugs that are covered under your plan. Well, why couldn't they just say that? Why do they have to call it a formulary, which sounds so [formalyary 00:24:39]? I mean, people don't use language like that. It goes on to explain the differences between Medicare Parts A, B, and D, although I wished that they explained why there was no C. There were about 70 different definitions on this site. I thought it was terrific. Joey: I agree. One of the ones ... I was just playing around with this, cost-sharing reduction, okay? This is basically a subsidy. It's a discount that lowers the amount you pay for your health insurance deductibles. Just the fact that they simply and straightforwardly, I just coined a word, defined these words for you and define these phrases, I thought was brilliant. Let's not forget the fact that the tweet said that Network Health Wisconsin leads Wisconsin and the nation in satisfaction, quality data, with both employees and customers. Folks, this isn't a coincidence. The more you make your customers happy, the more it will make your employees happy. Conversely, the more you make your employees happy, the more it will make your customers happy. This is a cycle. You spend time, effort, and money on one, and it naturally improves the situation for the other. This is pretty straightforward stuff that any company can do. Dan: Totally agree. The takeaways here are very clear. Look out for the jargon in your industry. Every industry has it. It might be difficult, archaic, hard-to-understand words. It might be acronyms that everyone in your building knows but no customer knows. Then make sure you find a way to translate these for your customers. It doesn't have to be in the form of a dictionary. If you can, stop using the archaic, hard-to-understand words and start using words that your customers understand. Remember that customers don't all speak the same industry language that you do. If you can do that, you will learn that sometimes the simplest words carry the most weight, because your customers understand. Joey: Listen in while we try to stump and surprise each other with a fantastic statistic from the worlds of customer experience and customer service. It's time to check out this number. Dan: So Joey, this week's number is 78%. What do you think it means? Joey: Dan, I'm going to guess that the 78% is referring to the percentage of time that an on-hold message says, "Your call is very important to us." Dan: Awesome, I love that you tied that back. It's probably higher, unfortunately. Joey: Doing my best. Doing my best. Dan: Actually, 78% of customers will drop your business after one poor customer service experience. This comes to us from our friends at Oracle CX and a study that they highlighted called the Five9 Customer Service Index. Now you can find the study at smartercx.com/experiencethis. What do you think about that stat, Joey? Joey: You know, Dan, we've talked about this time and time again on this show. I know you talk about it on stage. And I talk about it on stage. We're living in an era where the last great differentiator is the experience you give your customers. The challenge is your customers are now comparing you to every experience they have. The competition isn't just the other people in your industry or the organization down the street that your customer could go to instead of doing business with you. Your competition is Apple, and Amazon, and Netflix, and Tesla, and all the companies out there who are really committed to creating remarkable customer experiences. The bar is moving. It's lying on the ground right now, but it is moving. If you're miss-stepping in creating poor experiences, your customers are going to be leaving. The big problem I see with this, and I think there's some underlying data under this survey, is that the majority of these poor customer experiences are things that could have been easily, easily avoided if the organization that caused the poor experience and lost the customer had a commitment to creating remarkable experiences instead of just doing business as usual. Dan: I agree. For more great customer experience content, be sure to check out smartercx.com/experiencethis. SmarterCX by Oracle is the destination for professionals who are building the next generation of customer experience. Here, you can find breaking news, in-depth analysis, expert insights, and useful tools that will empower you to think and work progressively. Visit smartercx.com/experiencethis.